It is a question many players ask themselves as they face the twilight of their baseball odyssey: Do I end my career with five more years of acceptable performance, or do I overexert myself and risk severe injury by playing my best season on a major-league diamond? One player who chose the latter option was right-handed pitcher Milt Wilcox. A model of consistency in his previous seven seasons with the Detroit Tigers despite several shoulder injuries, he pitched through pain in to win a crucial 17 games during that blessed 1984 season. Then his major-league career ended within two years of the Tigers’ winning the world championship, though Wilcox made the successful transition to life after baseball. Milton Edward Wilcox was born in Honolulu on April 20, 1950. Moving with his family to Oklahoma at the age of 2, he was raised in Del City, a suburb of Oklahoma City. After he graduated from Crooked Oak High School in 1968, the Cincinnati Reds selected him in the second round of the June draft. Wilcox signed a $20,000 bonus contract with scout Tony Robello and began his professional career with the Reds’ entry in the Rookie Gulf Coast League. Later promoted to Tampa of the Class A Florida State League, he threw two shutouts and four complete games in eight starts. On September 14 — the day Denny McLain won his 30th game of the season for the Detroit Tigers — Wilcox married his childhood sweetheart, Lajuanda Faye Erwin. “All he had to do was pitch the same way he did at Indianapolis. There aren’t any superhumans in the major leagues and I think the kid has learned that.” Wilcox proved Anderson’s point on September 9 when he pitched a five-hit, one-walk shutout against the Dodgers. Only Maury Wills reached as far as second base. In five September appearances, Wilcox was 3-1 with an ERA of 2.42 as the Reds steamrolled to the National League West Division crown. Wilcox won the clincher in the National League Championship Series, giving up only one hit and striking out five in three innings of relief as the Reds swept the best-of-five series against Pittsburgh. But Wilcox lost Game Two of the World Series, giving up three hits and two runs in relief while retiring only one batter. The Reds lost the Series to Baltimore in five games. “You’ve got to give (Indianapolis manager) Rapp a lot of credit,” reported Anderson in his evaluation of Wilcox. “He’s sending us some fine pitchers.” Unfortunately for Wilcox, he competed with as many as eight other starters for a spot in the 1971 rotation. Anderson viewed him as a five-inning pitcher and declared him “expendable.” Wilcox started the season in Cincinnati and pitched in 14 games, but was optioned to Indianapolis. Despite the disappointment of being returned to the minor leagues, Wilcox once again pitched well. Pitching for Indianapolis, he fashioned a record of 8-5 with 62 strikeouts and 22 walks in 102 innings while limiting American Association hitters to a 2.20 ERA. Promoted to Cincinnati at season’s end, he appeared in four more games and for the year he went 2-2. As the manager of the Cleveland Indians’ affiliate at Wichita, Ken Aspromonte was particularly impressed by Wilcox’ss performance at Indianapolis. When promoted to manage the Indians, Aspromonte insisted on acquiring him, and the Indians sent outfielder Ted Uhlaender to Cincinnati for Wilcox on December 6. Aspromonte told sportswriter Russ Schneider “how good Milt was for Indianapolis,” adding that “when [general manager] Gabe [Paul] told me we had a chance to get [him], I told him not to wait a minute.” Wilcox had a better chance to flourish with the rebuilding Indians, and as an added bonus, he joined his hero, Gaylord Perry, in the rotation. Three weeks into the strike-delayed 1972 season, Wilcox appeared destined for stardom. His won-lost record was 4-2, while his ERA of 0.92 was among the lowest among junior circuit starters. Despite a May 12 loss, Wilcox still had fashioned a fine 4-3 mark with a 1.24 ERA when his photo graced the cover of The Sporting News — and bad luck struck again. Diagnosed with strep throat, he was confined to bed rest for a week. Wilcox returned to action in late May, but his mojo apparently went on the disabled list, as he endured a seven-game losing streak from June 14 through July 7, an experience that only hurt his confidence. After two more disappointing seasons (8-10 and 2-2), the Indians traded Wilcox to the Chicago Cubs for pitcher Dave LaRoche and outfielder Brock Davis on February 25, 1975. The change of scenery did not help as Wilcox posted an ERA of 5.63 in 25 relief appearances. Frustrated with the direction of his career as he was demoted to Wichita of the American Association in 1976, he considered quitting baseball. “He was scattery. ... he wasn’t getting his breaking ball over consistently, but he still looked pretty good. I figured then he’d be the guy we’d call up if we needed someone. We just sent him out to make sure his arm was sound.” At Evansville, Wilcox blossomed under manager Les Moss. He tossed six complete games in 14 starts, striking out 69 hitters, and posted an impressive American Association ERA of 2.44. 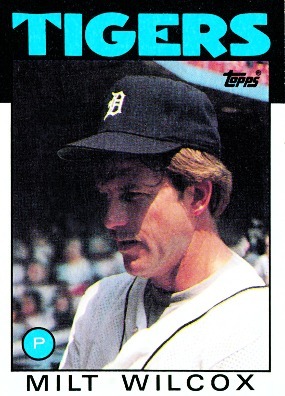 As Fidrych, Rozema, and Morris were counted on to contribute greatly in starting roles in 1978, manager Houk did not intend to include Wilcox in his rotation. Wilcox moved his family, which included daughter Stacy and son Brian, to the Detroit area, where he pursued bowling as an offseason callisthenic exercise. As he told Jim Hawkins of the Detroit Free Press, he could no longer “afford to be just mediocre.” When Fidrych and Rozema continued to struggle with arm injuries, Wilcox returned to the rotation and pitched his strongest season yet. Leading the Tigers with 16 complete games and 132 strikeouts in 215⅓ innings, Wilcox produced 13 victories as the Tigers recorded their first winning season since 1973. After Ralph Houk left as the Tigers’ manager, Wilcox was reunited with Les Moss in 1979. Although Moss named him to start on Opening Day, unusually bad April weather — even by Detroit standards — twice postponed the assignment, which ultimately went to Rozema. Luck continued to elude Wilcox as the season unfolded, as he lost three decisions by two runs or less during Moss’ brief tenure as manager. With the Tigers treading water at 27-26 on June 12, the Tigers fired Moss when given the opportunity to hire Sparky Anderson. For Wilcox, this reunion was less than congenial, as he had not enjoyed a favorable relationship with Anderson in Cincinnati. Demoted to the bullpen after two mediocre starts, Wilcox demanded a trade. But soon after the All-Star break, he returned to the starting rotation, won 12 games for the season and finished second to Jack Morris in wins, complete games, innings, and strikeouts, and led the staff in starts. Wilcox remained consistent at the dawning of the 1980s, winning 13 games in 1980, 12 in strike-shortened 1981, and another 12 in 1982. Detroit came within 1½ games of an AL East Division mini-title in the second half of 1981, and Wilcox contributed with a 3.03 ERA in 24 starts. He pitched 16 scoreless innings against the Yankees, a complete game against the Brewers without any walks, and a pair of pickoffs over the course of the season (reaching a career high of five in 1983). “I was born in Detroit but living in Chicago at the time. I went to see the Tigers every time they played the White Sox. This one day I left work for the ballpark, but a cop stopped me as I entered the parking lot. Lapides missed one of the most violent demonstrations ever to disgrace a baseball diamond in Disco Demolition Night. In cooperation with a Chicago radio station, the White Sox admitted 47,795 spectators for 98 cents and a disco record. The albums were collected for the purpose of destroying them between games of a doubleheader. The Tigers and Pat Underwood won the first game, 4-1. Then the ruckus began. “I was the scheduled pitcher for the second game,” Wilcox recalls. “I was actually walking to the bullpen to warm up when the records blew up on the field. Then everything went insane.” Hordes charged the field to express their vitriol against the disco music and lifestyle, throwing records like Frisbees and tearing patches of grass. Despite pleas for the fans to return to their seats, the violence intensified and the nightcap was called off — and later declared to be a Chisox forfeit to Detroit. For Wilcox, the new decade brought the return of the injury bug. In a bench-clearing donnybrook after George Brett hit the deck twice on two Wilcox offerings on August 5, 1980, Milt reinjured his shoulder. In October 1981, he dislocated his index finger in a charity basketball game, threatening the survival of his pitching career. Although Wilcox recovered to pitch in 1982 — he threw a one-hitter against the Royals on April 20, with Jerry Martin's second-inning single the sole blemish — shoulder and back injuries sidelined him as the Tigers lost ground to the Orioles, Red Sox, and Brewers. On April 15, 1983, Wilcox pitched within one batter of a perfect game. He retired the first 26 White Sox he faced before pinch-hitter Jerry Hairston reached base on a single. Wilcox had to settle for a 6-0 victory — and American League Player of the Week honors. No sooner had he pitched his masterpiece than the impending free agent raised contractual matters with general manager Jim Campbell. Wilcox posted double digits in wins for the sixth consecutive year in 1983. Winning 11 against 10 losses, he fanned 101 and sported a 3.97 ERA. True to his word, he filed for free agency. The front office could not justify matching the San Diego Padres’ offer of a two-year, $1.1 million deal to an aging right-hander with a history of arm trouble. Only when negotiations to secure Walt Terrell in a trade with the Mets failed did the Tigers match San Diego’s offer. Following the direction of new general manager Bill Lajoie, the Tigers signed him on December 29. Entering the 1984 season, the American League East had a surplus of talented clubs, including the defending world champion Baltimore Orioles, the powerful New York Yankees, and the up-and-coming Toronto Blue Jays. Even after finishing second to Baltimore in 1983 with 92 wins, the Tigers were expected to finish no higher than third — particularly after a moribund spring finish of 11-17. However, as Sparky Anderson told the Detroit Free Press, “I’m satisfied with everything about this club” — even comparing them to the juggernaut 1976 Cincinnati Reds. Anderson had every reason to feel confident about the Tigers in 1984. During the first two months of the season, they proved him correct, roaring ahead with a record of 35-5. Like the rest of the pitching staff, Milt Wilcox appeared impenetrable, even with his delicate arm. Wilcox won his first start, 3-2, over the White Sox in Chicago's home opener. By mid-May, his record had improved to 6-0, including a 4-3 nailbiter over the Oakland Athletics at Tiger Stadium on May 20. He never disclosed the level of pain through which he allowed himself to pitch. “I stayed healthy enough to never miss a start, but I had a feeling this was possibly my last year. I had seven cortisone shots that year,” Wilcox said. The risk of shoulder separation proved most problematic. Wilcox established a personal mark for wins with his 14th victory over Oakland on August 21, defeating Detroit native Lary Sorensen at Tiger Stadium. Meanwhile, he began alternative therapy using dimethyl sulfoxide, a wood byproduct intended for horses. Despite any evidence that the treatment was safe or effective on humans, Wilcox mixed the solution with oil, applying the ointment after he pitched. “We had something special and we all wanted it real bad and that’s why you saw guys like Milt fight through the hard times. ... Milt was having a great year and he knew what he meant to that ballclub,” Evans said. Wilcox victimized the Blue Jays twice in September for his 16th and 17th wins of the season. After destroying the opposition all season to win their first divisional title since 1972, the Tigers mauled the Kansas City Royals in the American League Championship Series. After outscoring the Royals 13-4 in the first two games, the Tigers sent Wilcox to start Game Three and potentially clinch the pennant. But would his shoulder cooperate? Instead, Wilcox was winless in Seattle, losing all eight of his decisions and posting a ghastly 5.50 ERA. In his final appearance, a ninth-inning relief stint on June 12, he surrendered a double to Carlton Fisk and a home run to Harold Baines in an 8-4 loss to the Chicago White Sox, although he retired the last batter he faced: Jerry Hairston, his nemesis from the 1983 would-be perfect game. The Mariners released him two days later. On the comeback trail, he joined a Detroit senior league in 1987 before receiving a tryout with the Giants the following year. Despite posting credible numbers with the St. Petersburg Pelicans of the Senior League in 1989 — 15-4 with a 3.44 ERA over two seasons — he never returned to the major leagues. Meanwhile, Wilcox’ss personal life was changing, as he divorced his wife late in his baseball career. In 2003, he briefly returned to professional baseball as a broadcaster for the West Michigan Whitecaps. The same year, he established Ultimate Air Dogs, a carnival attraction in which trained dogs enter aquatic long-jump competitions. An accomplished chinchilla breeder as a player, Wilcox stages up to 35 events each year. After many years in Michigan, Milt relocated to Jacksonville, Florida, where he recently married his wife, Cathi. Though his baseball career is long over, Milt Wilcox never lost his drive to compete. “I’ve been in front of 50,000 people with 50 million watching on television,” he told Joe Lemire of Sports Illustrated. “The thrill I get from dog jumping is the same as when I was playing ball." Charlie Bevis, Ken Breen, Clifford Blau, Matthew Bohn, Bill Gilbert, Maxwell Lapides, Alain Usereau, Milt Wilcox, Bill Young. Middlesworth, Hal, ed. Detroit Tigers 1978 Yearbook. Detroit: The Detroit Baseball Club, 1978. Middlesworth, Hal, and Dan Ewald, eds. Detroit Tigers 1979 Yearbook. Detroit: The Detroit Baseball Club, 1979. Middlesworth, Hal, ed. Detroit Tigers 1980 Yearbook. Detroit: The Detroit Baseball Club, 1980. Middlesworth, Hal, ed. Detroit Tigers 1982 Yearbook. Detroit: The Detroit Baseball Club, 1982. Paladino, Larry, ed. Detroit Tigers 1983 Yearbook. Warren, Mich.: Paladino Publications, 1983. Paladino, Larry, ed. Detroit Tigers 1984 Yearbook. Warren, Mich.: Paladino Publications, 1984. Paladino, Larry, ed. Detroit Tigers 1985 Yearbook. Warren, Mich.: Paladino Publications, 1985. Shine, Neal, and Bill McGraw. The Roar of ’84. Detroit: The Free Press, 1984. Smith, Fred T. Tiger S.T.A.T.S. Ann Arbor, Mich.: Momentum Books Ltd., 1991. Zaret, Eli. ’84: The Last of the Great Tigers – Untold Stories From an Amazing Season. South Boardman, Mich.: Crofton Creek Press, 2004. Eisenstadt, David. “Season to Remember: Baseball Dreams Become Reality at Tigers Fantasy Camp,” Toronto Sun, May 29, 2005. Available from http://www.tcgpr.com/baseballcamp.html. (accessed December 8, 2007). Falls, Joe. “Baseball Is All Business,” The Sporting News, May 2, 1983. Gage, Tom. “Finger Dislocation Worries Wilcox,” The Sporting News, November 21, 1981. Gerstner, Joanne. “Adults Become Kids Again: Fans Cherish Their Time With Heroes,” Detroit News, February 7, 2000. Available from www.mel.org. (Accessed December 17, 2007. par 19). Hawkins, Jim. “Chinchillas Now Part of Wilcox Tiger Act,” The Sporting News, July 29, 1978. Hawkins, Jim. “Outspoken Milt Gets Tiger Attention,” The Sporting News, September 1, 1979. Hawkins, Jim. “Tigers Discover a Winner — Dead-Armed Wilcox,” The Sporting News, August 6, 1977. Hawkins, Jim. “Wilcox Sets Sights on 30 Wins — as Career Total,” The Sporting News, November 12, 1977. Koelling, Les. “Sliders From Milt, A Starvation Diet, Triplets Discover,” The Sporting News, July 18, 1970. Lawson, Earl. “83 Percent Red Turnover in Three-Year Howsam Reign,” The Sporting News, January 24, 1970. Lawson, Earl. “Wilcox Gives Pitcher-Rich Reds More Reason to Strut,” The Sporting News, September 26, 1970. Lemire, Joe. “Lost & Found: Milt Wilcox” Sports Illustrated, July 2, 2007. Macnow, Glen. “Elder Statesman Role for Wilcox?” The Sporting News, February 10, 1986. Schneider, Russell. “Milt Wilcox: What an Injun Bargain!” The Sporting News, May 27, 1972. Schneider, Russell. “Tribe Dumps Three Dissidents, Sees Wilcox as Key ’72 Hurler,” The Sporting News, December 25, 1971. Schneider, Russell. “Wilcox a Wonder as Tribe Fireman,” The Sporting News, May 25, 1974. Schneider, Russell. “Wilcox Kicks Up His Heels as Shoulder Heals,” The Sporting News, May 26, 1973. Stone, Larry. “The Mariners’ 10 Worst Free Agent Signings,” Seattle Times, June 27, 2007. Available from http://seattletimes.nwsource.com/html/sports/2003751195.marimoney17.html. Accessed December 8, 2007. Twentyman, Tim. “Baseball Keeps Manager Young: As a Player and Now as a Coach, Corte Has Been a Stalwart on Jet Box Senior Team Since 1969,” Detroit News, May 12, 2007. Available from www.mel.org. (Accessed December 17, 2007). Vanochten, Brian. “Wilcox Eager for Television Chance: Former Tiger Joins Broadcasting Team,” Grand Rapids Press, June 7, 2003. Available from www.mel.org. (Accessed December 16, 2007).